When you are doing heavy duty work outside, whether it be construction or hiking, you don’t want to be worried about what kind of footwear you got on you. The best choice you can make when it comes to work boots, depends on what kind of terrain your intend to travel or what kind of work conditions you’ll be in. When you are wearing any kind of industrial clothing, it is not just about comfort. It’s mostly about protecting you from hazards that are part of the situation you will find yourself in. Taking these two things in mind, let’s have a look at the most important factors when it comes to outfitting a working man with the right kinds of footwear. Good shoes or boots will offer a person good comfort for the whole day. But they must also offer good protection. Like any kind of personal protective equipment (PPE) and industrial clothing, footwear can only properly protect you when it fits well. It is of the essense that you take the time to make your footwear fit properly on your feet. For this reason, it will always be useful to try out various brands, styles and sizes. Only then can you come up with the right fit for yourself. Many people choose to go for leather boots. But you need to take into account that leather can be quite stiff when new. Leather working boots are definitely some of the best high quality footwear out there. But keep in mind that leather footwear needs to be broken in. That’s why you absolutely have to get the right size for yourself. When you are going for waterproof, insulated work boots that you intend to use in harsh conditions, then you could possibly stand to get boots that are half a size too large. This way, you can also fit in an extra couple of thermal socks. Half a size extra can also be useful for people who need to outfit their footwear with orthopedic insoles for extra support. You need some extra space, if this is you. Even though it is most important to get the right size when you are buying industrial clothing, there are a whole bunch of boots that you can choose from. They are all designed with different situations in mind. Most often, workers will buy steel toe boots. These are very popular in the industry. Steel toe work boots offer very high protection from all sorts of crushing hazards. Your toes will need this protection, because the bones in your toes are not at all that thick. They also protect from ankle sprains and what not. These kinds of boots not only reinforce the toe area, they will usually also have high ankles for good ankle protection. You can also choose to go with waterproof or water resistance kinds of boots. When you are working outdoors and you are often on wet surfaces, then waterproof boots are a really good PPE item to wear. Especially if the fluids you work with are chemical that can be spilled. Some chemicals are so aggressive that they will soak through the boots and get to the foot. There, they might cause irritation. When waterproof boots are frequently worn in wet surfaces, then they will lose some of their waterproof-ness. It is very importants that a waterproof coating is reapplied to the boot every once in a while. This will keep them hole and scratch free. In some cases, you might want to be protected from electrical hazards. There is a special kind of footwear for this as well. The best electrical hazard boots will have insulated, and able to protect you for volt discharges of up to 600. Also, you can opt to go for slip resistant soles on your boots. This can be handy when you are working on slippery surfaces. Insulated boots are good for cold weather. While medical boots are good for using in a sterile situation. Not all brands are created equal. It’s important to get the right kind of brand for your boot. A few examples of excellent brands are Danner, Wolverine, Nautilus, Georgia Boot, Rocky and Bates. When you are judging them by price, make sure to pick a boot above the $100 mark, because that’s where the quality starts. Top work boots will go for as much as $200. There are many different kinds of boots in all sorts of different styles. They are often made of all sorts of materials. Your typical work boot comes with a high ankle. But if you’re looking for a more athletic style boot that is more like a sneaker or a cross trainer, then you will want a lower ankle. Oftentimes, leather is used in the making of boots. That’s because it is a very durable material, which provides excellent support. It is also naturally water resistant. The downside to leather is that it does not breathe. It’s a bit heavy and it can also decrease your mobility because of its natural stiffness. There are also the so called combination boots, which combine leather and a nylon mesh. This way, a good balance of insulation, comfort, durability and weight is achieved. 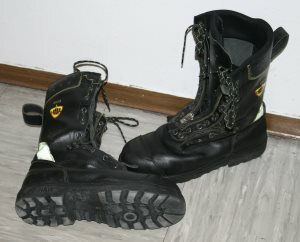 When you are looking at waterproof boots, then you will most often find that this footwear is made of latex and rubber. Padded insoles and waterproof liners are a type of accessorie that you will often find on many boot models. When it comes to industrial boots, they are usually manufactured using one of three manufacturing methods. The most expensive method is the one where the boot is stitched down. This is very rugged and also allows boots to be resoled. There is also the so called cement construction, where they glue the upper and the lower half together to become a single whole. This is less expensive. Then there is the direct attach method whereby parts of molded together during the manufacturing. This forms a pretty strong bond. Knowing what I’ve just tought you, it becomes easier to buy the right work boot for you, personally. Like with anything in life, you are going to have to do a bit of research to ensure that you buy the right one for you. This way, you will stay safest on the job the longest. Red Wing is a brand that is well known for creating darn good steel toe boots. Red Wing honestly, truly cares about its workmanship. They have been creating rugged footwear for well over a hundred years. These guys have experience and will never let you down when it comes to top of the line work boots. This is the reason why many people are of the opinion that this is the best work boot a person can buy. Red Wings are the boot for you when you are the kind of person that wants value for the money. They are definitely known for the renowned durability and their super high quality. There are well over 100 different kinds of Red Wing leather boots, so there are definitely bound to be some that suit you well, my dear reader. Red Wing also has non safety shoes in their assortment. These are the kind of boots you can wear all day long. However, when you are a working person and you do a lot of work outdoors, then you will want steel toes to protect your tootsies. Your toes require all the protection they can get, as they are not exactly the firmest part of your body. Red Wing hiking boots are also very popular these days. This company has all sorts of boots. You can use working boots for hiking, or hiking boots for working. It does not really matter that much. There are also cheap logger boots in their wide offer. Not produce plenty of inexpensive stuff as well. Perhaps you require a good pair insulated, waterproof boots. Then again, you may want to go for a classic pair of soft toe boots. Some people like the kind of fashion that never goes out of style. Red Wing guarantees you that you will get high quality, tough leather boots. All American made. A good reason to be sure of your country, my American readers. Premium grade leather is what Red Wing specializes in. They scrutinize their materials very carefully. Every bit of leather is examined to make sure that you get nothing but top notch quality. They will also last you a long time. What’s The Best Place To Buy Red Wing Work Boots? Even when the economy is doing well (but it never is, unfortunately), it still makes sense to shop around for the best prices. Financial times have not been kind on us for the past decade or so. For that reason, it’s a good idea for you to look around for all the best bargains out there. Red Wing is a top notch brand and its prices will therefore, on average, be a little higher than those of the competition. For that reason it is a really good idea to make a few comparisons and get the lowest price for yourself. Naturally, I would recommend that you start at all the usual suspects, such as Amazon and eBay. Maybe you know of other online outlets yourself. When you are buying shoes and boots online, you will always be off a lot cheaper than you would be when you are buying retail from brick & mortar stores. These kinds have overhead and need to have higher prices to recover their investments. When browsing around on the Internet, you are going to find some really cheap bargains and good deals. And if you do not mind that your boots have already been worn by somebody else, you can simply go for used work boots, which are usually fairly inexpensive. So if you’re looking for the creme de la creme, then you know you’ve gotta go with Red Wing. Browse around on Amazon or any other online outlet and see if you can’t find a good deal at the moment. This brand is the top work boot brand and your feet will thank you for buying them. If you are serious about protecting your feet from a number of unnecessary injuries, then you will need to have a look at safety work boots. 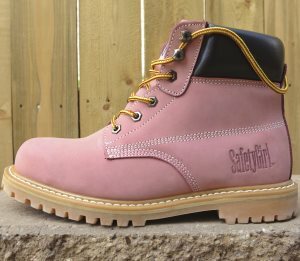 If you are a construction worker that works on big buildings and hazardous construction sites, then it is essential that you get good construction boots with good protection. A good safety work boot is not only going to be a very snug fit, but it will also protect you from heavy, falling stuff. There are plenty of different kinds of boots available in today’s market. They are known for their high durability, and are therefore not only popular for workers, but also for hikers. A good work boot is going to be made of a high quality material such as leather or suede. It will also be waterproof. Additionally, it will also resist oils and chemicals. It does not matter whether you are drudging around in the rain or in the snow or in the mud. Your feet will remain dry. When you get a work boot with a steel toe, then you are sure to have minimized pretty much every risk to your feet. Steel toes are very suitable for working at construction sites, where there are often heavy and sharp objects that fall. Steel toe shoes have been reinforced at the, you guessed it, toes… in order to provide better protection for your feet. You will aos often find metal mid soles on these kinds of boots. A metal mid sole will give you yet extra protection from, for example, puncture wounds. When you are working in cold and wet conditions, you will definitely have to use insulated boots. Even in the absolute worst conditions, your feet will remain comfortable and warm. When you are going for a high quality insulated boot, then you will get great strength that is bound to protect your feet all day long, no matter how hazardous your working conditions are. You will have to consider your own job’s requirements before you buy a pair. It’s all about finding the right pair of working boots for the right kind of job. Researching the best work boot for you is totally worth your time. There are many different kinds of styles and colors in which you can find boots for working conditions. Boots made of different materials and with different features, will be available at different places. Both online as well as offline. When you are going for safety boots made of synthetic materials, you will get the lower price. However, high quality leather work boots are always going to cost a bit more. Most online stores that I have visited, offer a wide range of boots so that there is a style and quality to be found for every budget range. You will also be able to find boots in all the sizes with online retailers. It is always better to prevent an injury than it is to cure one. For that reason, a good pair of safe work boots will be a pretty good investment on your part. You absolutely have to have a good pair of boots for working, when you are doing lots of work in slippery, moist, wet and/or cold conditions. They are going to do a good job of keeping your feet warm. Additionally, they will protect your feet from becoming injured. They will also prevent you from slipping or even getting electrocuted. Boots can have a lot of different kinds of characteristics. For that reason, it is recommended that you study the topic a bit so you know what you are looking for. Employers will often come up with a good set of recommendations for protective footwear for heavy duty jobs. But what options are there available for workers? When you are working at a construction site, you are probably wearing a mandatory helmet. There is lots of stuff that can roll or fall and permanently injure you. But you need not only protect your head. You must also protect your feet. When you are going to go with steel toes, then you can rest assured that your toes will remain safe no matter the circumstances. When you have all that extra strength up front, your toes are almost impossible to injure. Whether it is a heavy object or a sharp object falling on there… pretty much nothing will penetrate a steel toe shoe. You will also be protected against a sprained ankle. There are types of safety footwear that even goes a step further (pun intended). Some shoes will have a so called metatarsal guard, which protects the metatarsal feet bones. These are the bones in the middle of your foot. These are sturdier than your toes, but still pretty fragile. Not all jobs require that you wear steel toes, though. If you’re working a physically less demanding job, a soft toe will do the trick just fine. Outdoor workers are going to have to adjust to the conditions of their surroundings. This includes clothing as well. You are going to require gloves, pants as well as boots in order to protect from the outside elements such as cold, that would otherwise reduce your productivity. You do not want to skimp on the quality of your safety gear, as this can give you a nasty case of frostbite. A good pair of insulated boots will guard you well against the cold. Have a look at Thinsulate boots, for example. These do a really good job of keeping your feet warm. At the same time, they do not at a lot of weight to your footwear. But… How Waterproof Is It? Whether you are working outdoors or indoors, employees can end up in damp or wet environments. They might even have to work in snowy areas. Wet conditions are best handled by getting the right footwear for yourself. There are plenty of brands that offer waterproof boots. Usually, the exterior of these waterproof boots will be treated with a coating. But higher quality (and more expensive) boots, are going to have liners in them. These will keep the water out, but will still let your feet breathe. If you want to get good performance when working in the snow, then you will absolutely have to get a pair of boots that are waterproof. A good liner can definitely keep out a lot of the moisture in your working area. But what about the boot’s sole? If you want full protection against moist environments, then you will also have to have a slip resistant sole under your boot. This kind of footwear is essential in many different kinds of outdoor working environments. Think of chemical handling or food processing, just to name a few. If you are working in any kind of environment where you might slip, then you are going to need some traction supported boots. Either that, or you will have to modify your existing footwear. You can do this with overshoes, or by resoling. If you are working very extreme weather conditions, then you will have to use insulated boots. It does not matter whether you have work to do, or you are just having fun outdoors. You will need to protect your lower extremities by wearing insulated boots. There are lots of online retailers that offer these kinds of boots, such as Amazon Everybody knows Amazon, ofcourse. They have a very wide offer of men’s and women’s insulated boots. I have bought plenty of boots from them before and I have liked most of them well. The ones I did not like (or were not a good fit), I simply returned without trouble. This is my one stop shop for insulated boots nowadays. But I am sure there are other places on the web that also sell good footwear. There are a number of guidelines that you will probably want to stick to when you are purchasing a good pair of work boots to protect you. The style: The insulated footwear that you will find online is going to be available in either single or double styles. The single style boots will have a single layer of insulation. The double style boots will have two layers of insulation, also referred to as double insulation. This makes them resistant to extremely cold temperatures. You will have to research whether or not you require double style boots. If you are working in some pretty extreme temperatures, then double styled boots will probably not be overkill at all for your personal work place. If, however, you are only wearing insulated footwear because you want to make a fashion statement, then single layered ones will do just fine. Comparing footwear: I’m sure that, by now, you’ve already figured out that you can save big money by simply shopping around. Shoes can cost a lot of money, especially the higher quality ones. Shopping around definitely pays off. But not only do you want to compare prices. You will also want to compare the weight of the shoes you are looking at. For example, single layered shoes are always going to be lighter and more flexible than double layered shoes. Getting a good fit: You absolutely owe it to yourself to ensure that your new shoes or boots are going to be a really great fit. You will have to find out what your size is before you order a new pair of shoes. This is especially true if you are ordering online. To make matters more difficult, some shoes (or brands) will run larger or smaller in size than others. There is an extremely large collection of footwear available at online retailers. Finding new boots is not going to be hard. Finding a good pair of boots that is exactly the right type for you, is definitely a bit harder! A lot of the boots being offered at online stores are also good for making fashion statements. They go well with your other fashion items, such as pants, shirts, jackets, etc. When these boots have extra layers of insulation added to them for extra protection, then they will also be very suitable for working conditions. Insulated boots are always going to be heavier than the ones that have not been insulated. This makes them great for outdoor usage. There is no escaping the fact that you will require heavier shoes when you are working outside in extreme weather conditions. But insulation can also provide extra comfort when you are simply wearing them because you want to look fashionable. There are plenty of boots to go around on, say, Amazon. They are offering a very wide range of working boots, in a wide price range as well. They often discount their stuff super aggressively. You will also like their free super saver shipping. I myself have purchased plenty of boots from them in the past, and so far I have been very content indeed. Generally speaking, their customer service is fast and professional. It’s the main reason I keep shopping at them. They have all the best work boots. There is no need to be paying through the nose in order to buy insulated boots. There is always some sort of discount available on some pair of boots, somewhere. Browse around and find a good deal for yourself. Your efforts will certainly pay off. That’s how it works for me and that’s how it can work for you! Your PPE is worth your time. You probably know the feeling… You have cold feet and they are starting to hurt. That, in turn, makes your legs ache and they start to get cold as well. Next up, you yourself start to feel like you are freezing. Do not let cold feet ruin your outdoor activities. I have let the cold screw up my winter fun time outside plenty of times already. But this year it will be different. I want to share my experiences with you. I have done some research into this topic and I believe that I know what I am talking about. Whether you enjoy hiking, hunting, fishing or snowmobiling… you are going to want to have fun doing it and not suffer from cold feet. Not if you intend on having fun, anyway. Once your feet get cold, you’re going to have a bad time keeping the rest of your body warm and comfortable. You will not be able to have a good time this way. An additional problem you can have with body parts that get cold, is that they can also start feeling numb. That is dangerous, because you could injure yourself and you would not even realize it. You will have to keep your body parts comfortable, dry and warm. It’s pretty much required in order to have fun outside in the winter. I needed to factor in a lot of stuff while doing my research. There really are a lot of different kinds of winter boots, both brandwise as well as stylewise. I needed a pair of affordable, insulated, waterproof winter boots that were also rugged and at the same time good looking. I was asking myself extactly how cold the environment would be in which I would be wearing them. This is an essential consideration. It’s important to consider whether you will be walking around in snow or very uneven (rough) terrain. Or do you not know upfront what kind of conditions you will encounter, and do you simply want to be prepared for everything? The Sorel Conquest Winter Boot turned out to be a good one for me. It’s a good boot for pretty much all winter sports and outdoor activities in snowy areas. There are a number of things that make this boot the number one boot for me, personally. First of all, the Sorel Conquest boot has a pretty thick, 400 gram Thinsulate Ultra insulation. That’s enough to protect your feet from temperatures as low as 40 degrees Fahrenheit. This will easily keep your feet warm while skiing, hiking, snowmobiling, snowboarding, hunting, partaking in outdoor sports, etc. No more cold and numb feet for you! These are waterproof, full grain leather boots. That means it’s an excellent quality leather. Leather does a really good job at keeping moisture out. This Sorel footwear is also a seam sealed winter boot. That further helps in keeping your feet warm and dry. Slushy snow does not stand a chance of getting inside. The seams are very well done. You can rest assured that they will not leak. There is a simple barrel lock closure on the integrated gaiter/bootie that will keep snow outside of boots when walking around in deep snow. If there is anything I can not stand, it is getting snow in my boots. The Sorel Conquest boots also have a so called Achilles adjustment strap that you can tighten up to increase your ankle support. That can really help a guy out when hiking or traversing uneven terrain or upward slopes. This is really great, because it can prevent the boot from rubbing and slipping at the back of your heels. Don’t you hate it when you get heel blisters? They also come with a so called EVA midsole, which can optionally be removed. It gives you much extra comfort and cushioning. It also adds extra thermal protection, which is suitable for long days out in the cold. This way, you are able to enjoy your wintertime outdoor activities even longer. The Sorels also have a multi directional rubber sole. This is a very rugged sole which provides you with some pretty extreme traction. You will be able to keep standing up straight on very icy and slippery terrains. For the reasons stated above, I am of the opinion that the Sorel Conquest men’s and women’s winter boots are very suitable for those that enjoy having loads of fun in cold weather during wintertime. Naturally, I wanted to know where I could get these boots the cheapest. There are a bunch of online retailers that are offering these boots. You just have to look around a bit and see where they are offering the best prices and the best return conditions. It helps to have free shipping, because this obviously is a good way to save money. Free return shipping is also always a great way of saving money. You also need fast delivery, ofcourse. That’s why I usually get them at Amazon. But if you can get them at other online retailers at better prices and conditions, then please let me know in the comments below! If you are a woman and working as, say, a nurse, a chef, a waitress or a police woman… then you will need good working shoes in which you can stand up all day. Especially for all of you working ladies out there, I have created a page that will help you find the most comfortable women’s working shoes that will allow you to stand up straight for hours on end. Not only will you require great support for standing comfortably all day long, you will also need good protection. Nurses and lab workers are often working with hazardous chemical materials. It’s absolutely essential that a good pair of shoes will provide protection from any nasty spills that may occur during your work. Different jobs have different requirements. Make sure you get the right kind of footwear for yourself, ladies. 5 What’s The Best Place To Buy Red Wing Work Boots? 10 But… How Waterproof Is It? This page was last updated on February 6, 2019 . Hi there it’s any tipe of steel toe boots with leather inside or cotton ? nothing artificial ! Check out my work boot page to see if you can find something in there! Your message is hard to interpret. Could you clarify? Does anyone make a dress shoe similar to the way Keene makes their shoes with a rounded toe box that actually mirrors how your feet are? I have very expensive shoes that I can’t even wear b/c they hurt too much. I want comfortable shoes that I can wear with a suit. Rockport seems to be about the only ones in the North East. Believe it or not, but I have a page up on comfortable dress shoes. Do you know what brand of boot the first and seventh pictures are. Do you have any suggestion for a work boot for a rock driller? The terrain is rough, brutal, uneven, hot, slippery, desert, tundra, all wrapped into one. I’ve been using Danner Quarry but they don’t last more than a few months. Looking to get new again (last bought in June) and was hoping for insight and options. There’s no Google answer – I’ve tried. It sounds to me like you’re using your boots pretty intensively. When they have that much to endure, it’s expected that they won’t last as long as you’d like them too. But still… I have a really great work boot page up on Boot Bomb with many boots you might want to try. I’d look at a couple of those and read the reviews to see if you can find out which ones last the longest.